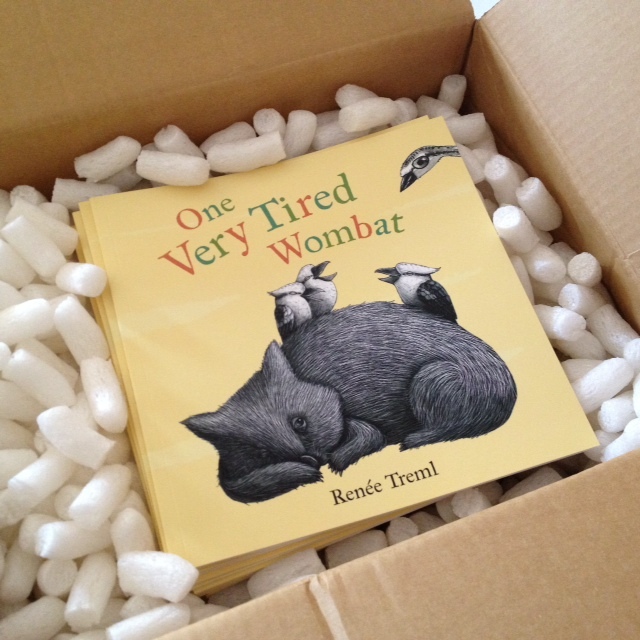 …my advance copies arrived! I am so excited to have this box of books in my hands, which means the release date is just around the corner. In fact, just a mere 23 days away now. I will be back in the studio on 11 September, but will be checking emails while I am gone. Enjoy your August! 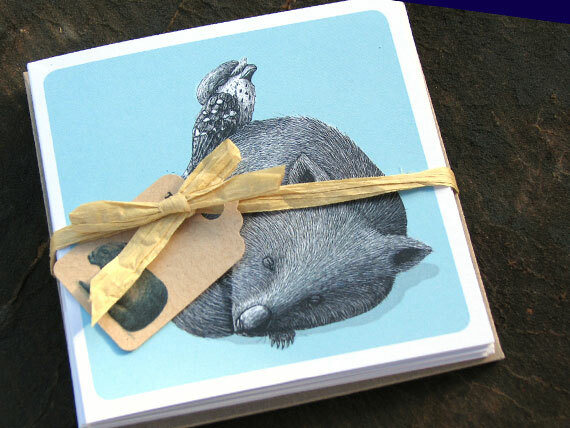 Well, we all know I just had to squish a wombat into a teeny tiny tea cup (sorry Wombat!). I hope you enjoy. All these brand spankin’ new Tea Cozies are available as prints by special order and wholesale. Please email me at Renee.Treml[REMOVE]@gmail.com for details. Kangaroo Island was full of big eyed brush-tailed possums. At night these fluffy critters were seen time and time again, lumbering slowly across the street. [Note to self: for less stress next time, don’t drive at night on KI.] They remind me of a less-than-graceful cat who really can’t be bothered (I’m not mentioning any names…). Also feeling very inspired by all the roos, wallabies, koalas and echidnas we saw on our visit. Hopefully this cold weather will keep me in the tea cozy spirit long enough to finish a few more pieces. We are making the long drive to Kangaroo Island (SA) for a little holiday this weekend, where it is bound to be very very chilly. So, I thought I would share some more warm-and-fuzzy coziness with you, because I am certainly going to need it. 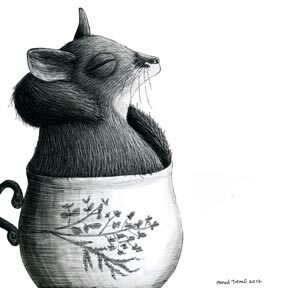 This is a greater bilby — a type of bandicoot with big rabbit ears and a long tail — sitting in a teacup adorned with Mitchell grass. Bilbies used to be distributed across most of Australia, but are now endangered, so we see them most frequently at Easter-time as chocolate “Easter Bilbies.” You can read more about these lovelies (and how to help) at Save the Bilby Fund. 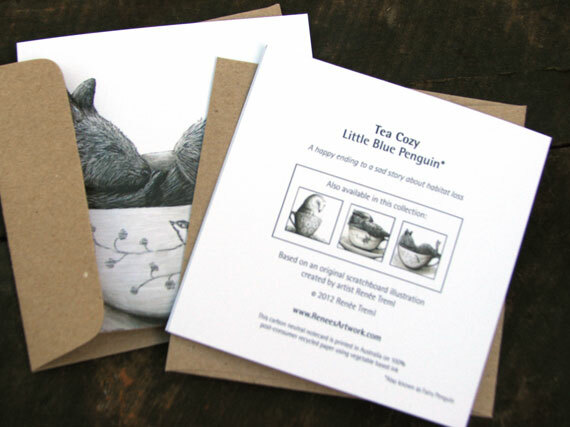 I have a few more warm-and-fuzzy tea cozies in progress and when the series is finished, or better yet paused (perhaps when it warms up a bit), I will make the collection into a new set of notecards and prints. 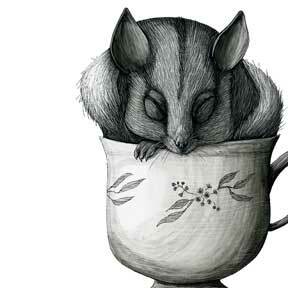 This is the first of the new pieces — a cozy little sugar glider nestled up in a cup of tea. I have a few others in the works, which I will post over the next few weeks. I hope you are warm wherever you are! 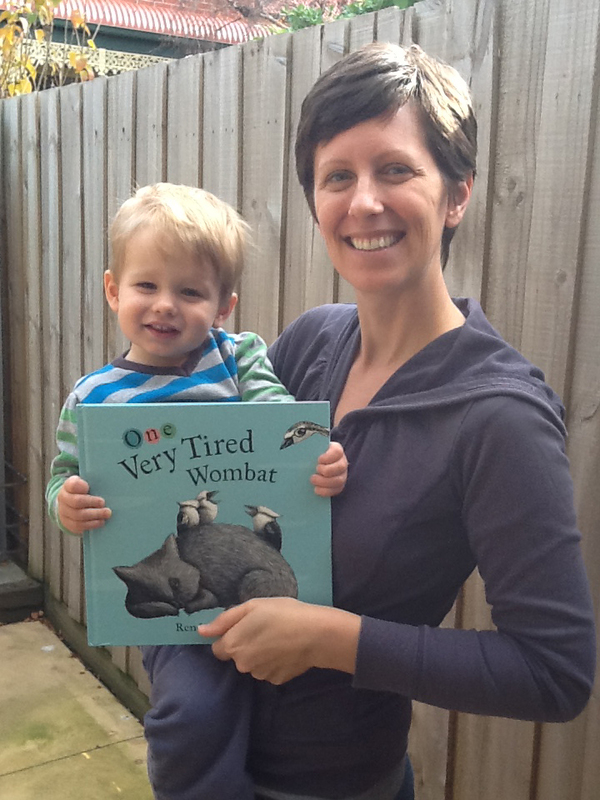 I don’t have the words to express how chuffed I am to have in my hot little hands a pre-release copy of One Very Tired Wombat! I am so thrilled by the quality of the print and, of course, that I didn’t find any mistakes (whew! I was really worried about that bit — I guess all those years working with government editors has made me a tad paranoid). The book will be available in Australia on September 18 — that is just 72 days away, but who’s counting? 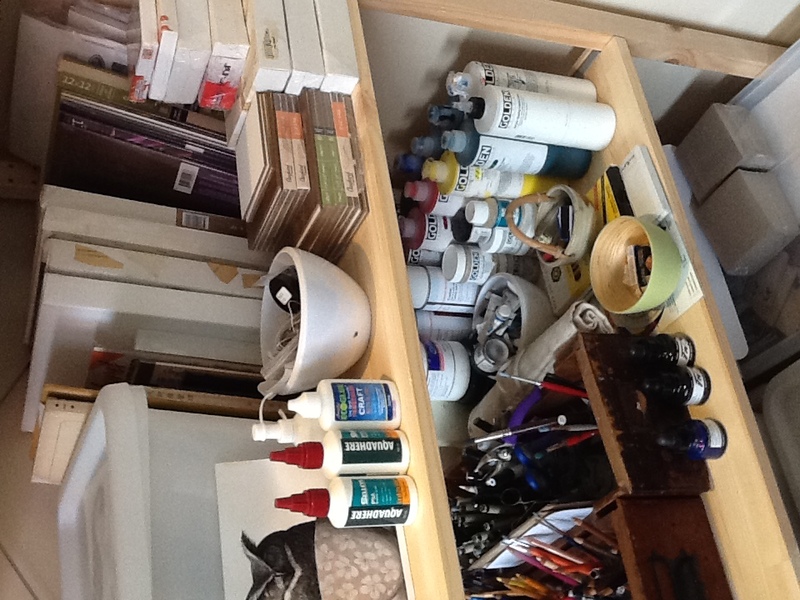 The best part of moving studio is the first few weeks when everything is so beautifully organized. This is the only time my husband can enter my usually chaotic studio without cringing at what appears to be a disorganized mess (but we all know better, right?). Anyway, I just wanted to say ‘I’m back’ and thanks to everyone for your patience during this big move. I am officially accepting special orders, wholesale orders (email me at ReneesArtwork[remove]@gmail.com for the Winter 2012 Catalogue), and even my Etsy site is updated. 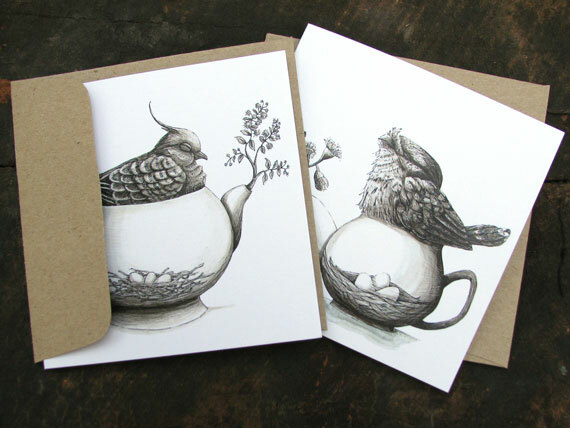 While things were in storage, I had some gorgeous new note cards printed by PrintTogether, which is conveniently located in my new hometown of Melbourne. These little 100mm square cards are carbon neutral — printed on 100% post-consumer recycled paper with vegetable-based inks — and I still use the recycled kraft paper envelopes. I think they are just perfect and I hope you like them too! I just wanted to send a big thank you to Brisbane’s Map Magazine for featuring me in their latest issue. You can read the article at http://issuu.com/mapmag/docs/mm139-web/19. The article was written by Frances Frangenheim with photographyby Mikki Brammer and they were absolutely lovely in every way. 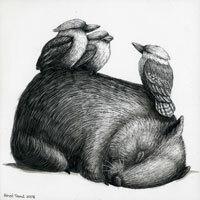 One of the first very tired wombat pieces which inspired my upcoming picture book. Just want to give a shout of thanks to two of my favorite blogs for featuring my work and hosting holiday giveaways. First on the list of thank you’s is my good friend Steph at Bondville for a lovely feature on my new line of ornaments, brooches and necklaces. You can read it here and while you are browsing, be sure to spend some time on the site looking at her gorgeous site for “mums who love design.” She is also hosting a subscriber giveaway so sign up to receive her newsletter and enter to win a necklace or 3 ornaments of your choice! The winner will be announced tomorrow (10 December) so be sure to pop over there today. The second on my list of thank you’s goes to Shavani at My Owl Barn. If you love owls, then you will just fall in love with this blog — it showcases owls in art, design, vintage, food, parties and more! In honor of her birthday, she is hosting a holiday giveaway to two of her lucky readers to win either a necklace or three ornaments. You can read about how to get your name in the draw here — but hurry up, winners will be chosen soon.